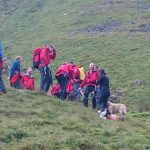 Incident Details: As the previous callout was coming to an end, the Team was paged again, this time to a 30 year old cragfast walker on Sharp Edge. He had been negotiating the edge with a friend, but they had become separated, and he had tried to find a way back down. He became cragfast in a very precarious position on the edge of a steep drop on the north side. With the rain coming in, this swiftly became a really unpleasant place to be, as he was unable to move at all from what appeared to be the only safe point. The Team turned round within a couple of minutes, and set off for Mousthwaite Comb. Even with the swiftest members at the front, it was an hour before they were on the scene, and then they had to rig the crag to ensure the safety of the casualty, and the Team member who was to be lowered to him. Once the rescuer had reached the casualty he was put into a harness, and the Team member was able to negotiate a way down and across the gully with the casualty, until he could be recovered on to the lower path. He was then assisted down to the bottom of the hill. We would just re-iterate our advice that Sharp Edge is a serious undertaking, and once bad weather arrives, the risks escalate swiftly. The rock holds water, and is nearly always slippery – pick your day, and watch your step. 16 Team members – 4 hours 10 minutes.